This Custom Twister Trailer has is it all for way less than the competition's pricing! 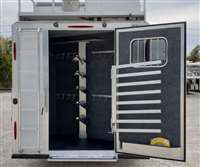 Trailer Features: 5 Horse Side Load, 38' floor, 8' wide by 7.5' tall, Triple spread 8k torsion axles, 17.5" Aluminum wheels w/18 Ply tires, Hydraulic brakes, Hay pod, Angled ladder, Dual hydraulic jacks, Full back tack, Fully insulated, Drops front and back, Mangers under 4stalls, 2 Stud dividers, Escape door, Walk thru door into LQ, Fully extruded sides, Stainless steel front. 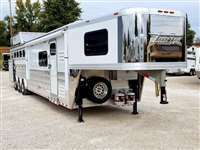 LQ Features: 15' Trail Boss Conversion, Sleeps 5-7 comfortably! 78" slide room, Onan generator, On-board satellite w/receiver, 18' Electric awning w/shield, Genuine leather accents and yokes, Solid Alder cabinets and moldings, Two Sofa sleepers, Fold down bunk, Queen mattress, Ducted 15k AC unit, 6.0 Fridge, Convection Microwave, Porcelain sinks, Tin back splash, Pocket door into bath, Pocket sliding screen door, Wooden hat racks, Flat screen TV w/DVD, Inside/outside speakers, Large bathroom w/ marbled radius shower stall, Vanity & Linen closet, 48" Floor to ceiling wardrobe closet. Call Dave for more info, 314-498-9891 or email Walther2012@aol.com Trades, Financing and Free Delivery are available!